When you live in the megalopolis of 10 million inhabitants with endless queues of traffic like Bangkok, you need to occasionally escape to somewhere with more fresh air. The problem is that leaving Bangkok for just one day is hard, it takes too long. If you want to go out for two or three days you have several destinations: Hua Hin, Kanchanaburi, Khao Yai or even the islands of Koh Samed or Koh larn. But … And then? If you want to escape the chaos of Bangkok just for a few hours, What can you do? That’s what I wondered for a while, until one day looking at Google Maps I noticed a huge green area that appears to have been cast almost in the middle of the city. It’s called Bang Krachao. Observing Bang Krachao from Google Maps seems almost suspicious that such a green area is in the heart of Bangkok and almost nobody talks about it. Most bangkokians, whether Thai or foreign, have never set foot on it or are even aware of the existence of Bang Krachao. A little over 6 km of one of the most important commercial areas of the city, Sala Daeng and Sathorn, survives this green island protected by Thai law. In Bang Krachao you will find a well-paved road and many other roads with virtually no traffic coming out of it. 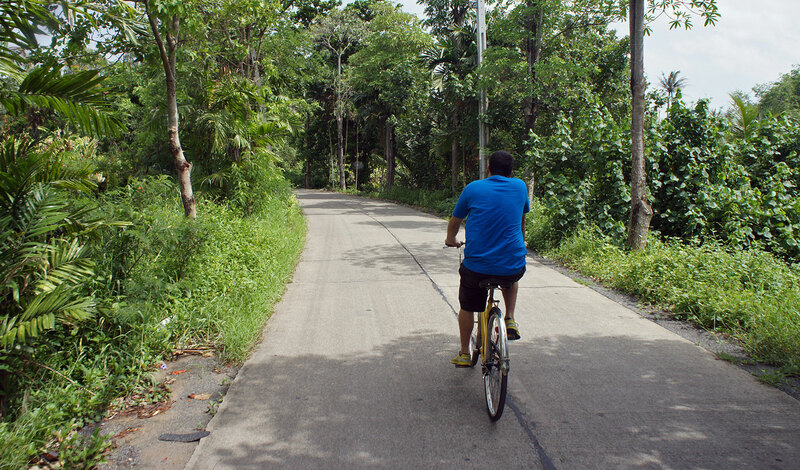 All these small roads are surrounded by green, tropical vegetation and the best way to explore them is by renting a bike (100 THB all day) on the pier after getting in by boat. Yes, to get to Bang Krachao you’ll need to take a boat that crosses the Chao Phraya River. When you’re in it, you see the cargo port of Bangkok and in the distance, some of the big city skyscrapers while in the boat, you are running away from them. • Nakhon Si Khuean Khan Botanical Park: Very cool park where you can go and spend a day. • Floating Market weekend Bang Talad Nam Peung: A market where you will find a lot of food and some clothes and souvenirs. Do not expect many canals with boats. There are some but not many. Finally, in Krachao Bang there is a pretty cool little hotel called Bangkok Tree House. Not cheap, but the rooms are in trees. Isn’t it cool? The best way to go is to take the MRT (subway) and get off at Kloeng Toei. After that you’ll have to take a taxi, motorcycle taxi or tuk tuk (50-100 THB) to Kloeng Toei Pier.